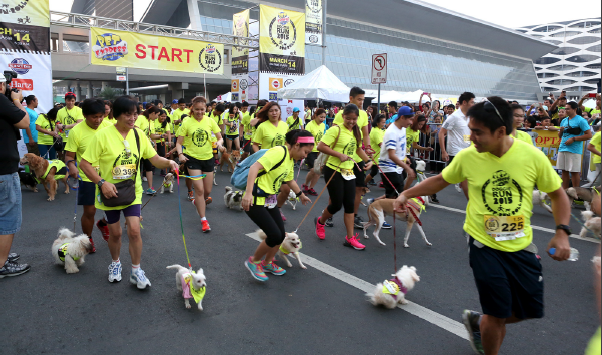 Over a thousand doggie runners and 1,200 of their humans took part in the latest Pet Express Doggie Run on the roads along SM Mall of Asia. 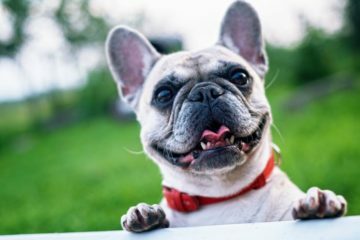 The fun event has been eagerly anticipated by dog lovers and running enthusiasts alike every year since its inception. Stroller Category in addition to its traditional 1.5/3/5K race categories. went through various “pit stops” or obstacle courses. Beginning at 5:30 a.m., the event saw a lot of action, and with runners wearing neon green bibs that glowed in the dark of the early morning. Later, some participants ran with two dogs; others wound up carrying their dogs to finish the race. Much humor was provided when some dogs broke free and ran the race alone; this in contrast to the dogs who simply fell asleep and wound up being carried throughout the race. Speedy participants in the shorter distance categories finished in seven minutes; though both they and their dogs were tired and thirsty, their energy was still high after finishing. The festivities continued after the race with raffle prizes and games at sponsor booths. Dogs enjoyed a water pool where they could swim; together with their humans, they also enjoyed a photo booth. Doggie runners in all shapes, sizes, and breeds who ran and finished the race were awarded finisher loot bags and finisher doggie medals, which all four legged runners wore with pride. The first, second, and third place winners of the Pet Express Doggie Run 2015 were awarded with a trophies and sacks of dog food and goodies. Now on their fifth year, Pet Express is fully committed in making the Doggie Run bigger and better, giving their customers a fresh take on leading an active EVENTSlifestyle alongside their pets while raising funds for a charitable cause. A portion of the proceeds will go to Pet Express’ chosen beneficiary this year, PAWS (Philippine Animal Welfare Society). Event sponsors were Cesar, Pedigree, Science Diet, Beef Meal, Holistic Recipe, Four Paws, Hartz, and Smartheart; organizers also thanked Pampered Pooch, Play Pets, Sergeant’s, WAHL, Ezydog, Ibiyaya, Royal Canin, Frontline, Heartguard, Loyal Paws, Kong, Good Boy, Nutripet, DoggyMan, Pawsh Couture, Saint Roche, Happy Pets, Bayopet, Advocate, Cosi, Alpo, Little Mates Enermix and Apt Formula Nutrimix, Canidae, Eukanuba, Odra Couture, and Toy Kingdom. Media partners were Luv U Pet, Manila Bulletin, and Animal Scene Magazine. This first appeared as “People and Pooches Pound the Roads” in Animal Scene’s May 2015 issue.